The Cascade Brewery building was originally a sawmill. Why did I visit the Cascade Brewery? The first time I saw a photo of the building I was drawn to its chateau-like appearance. When I discovered they conducted tours I knew I had to see it. Nothing like having a sticky beak! I'd enjoyed a few Cascade beers in my time so visiting the brewery itself definitely interested me. Not only that, I'd enjoyed Cascade's non-alcoholic beverages too! I love their blackcurrant cordial in particular. Greg, my non-alcohol-drinking husband was fond of their ginger beer. So what did I think of the tour? I loved it. It's great if you're the sort of person who likes to walk around, look at things and find out how stuff is made. Especially stuff that you enjoy - like refreshing beverages. The tour guide was terrific - he gave us plenty of opportunities to ask questions. He showed us some of the different components that go into beer-making. We had a look at different kinds of grain that might be used in the process. We even got to have a sniff of the different grain types. Some were light in colour, some were dark in colour. Some had a stronger smell than others. The beer you get depends a lot on the grain you use. Cascade Brewery actually produce their own malt on-site. This means they have control over that operation as well, rather than just receiving the end-product from another party. They get to decide how the malt comes out, have control over the quality and so on. We crossed the road from the visitor centre to the main brewery building. In the brewery building we were shown all the different bits of the manufacturing process. We went upstairs and downstairs. 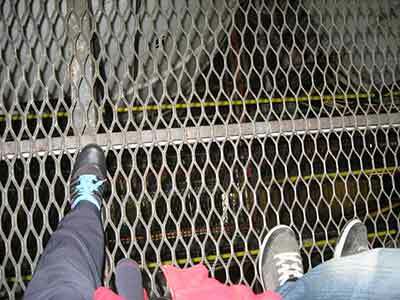 At times we were standing on a floor made of metal grating and could see way way down. The guide was very considerate and warned us in advance. Just in case there were people who didn't like heights. 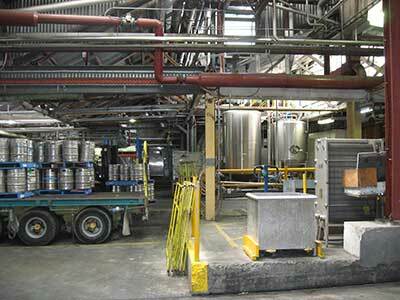 The guide pointed out a huge container that continued to be utilised even after bushfires destroyed most of the brewery causing many manufacturing operations to be shut down. It's thanks to that vessel, he told us, that we can say Cascade Brewery is the country's oldest continuously operating brewery. He invited us to hug or kiss the vessel depending on how carried away we felt. Ok, I'll admit it, I did give it a hug and a pat plus mumbled a thank you! The brewery building used to be a sawmill. Looking at the building you can actually spot the original and the newer parts of the building. 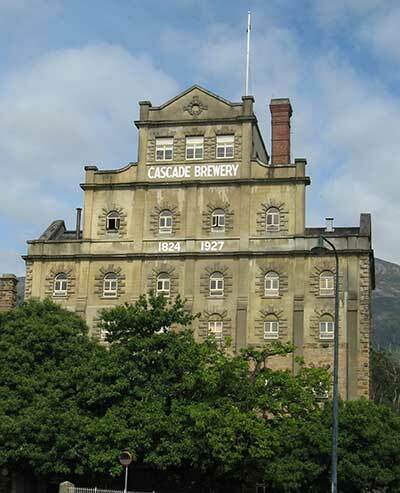 Well I can't be talking about Cascade Brewery and not mention Peter Degraves, who founded the company in 1824. As seems to be the case with many Tasmanians and Australians who went on to do great things, Degraves spent a few years in prison! I can't remember which drinks exactly I chose to sample at tasting time but they were good. (You knew I'd say that). I do remember buying a Cascade Draught to take away with me to enjoy later that evening. Why did I choose that one? Because it's one of just three beers that are available for sale in Tasmania only. I wanted to make sure I got to taste one of them before I left for home! I did try one of the ciders. That was pretty lovely. I didn't know that Cascade did ciders (and that they tasted so good) prior to doing the tour, that is. One tip I'd like to offer - allow yourself more than 2 hours so that you can do the tour and tastings, plus have some food, check out the souvenirs and have a wander through the lovely heritage gardens. For more information on tours, go to the Cascade Brewery website.